I tied the knot on August 30, 2013! I have always loved the wedding industry but I can now say I LOVE IT EVEN MORE! Professionally, I gained new insight and how to be a better vendor through the process of planning our wedding. Personally, it was the second best day of my life (only after birthing my daughter Rheya Lee) and I was reminded at how fortunate I am to be surrounded by incredible family and friends. I am forever grateful. Below I will share with you what I wrote down about our wedding as a "journalist". 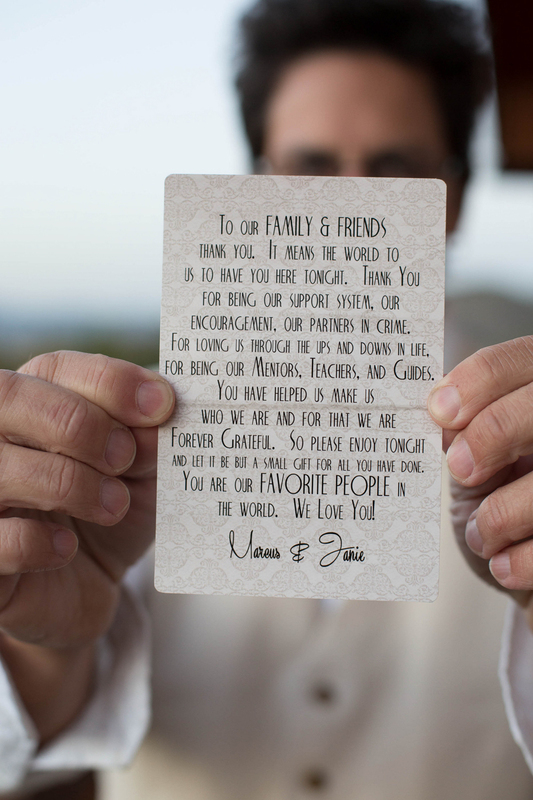 Everything about this wedding exuberated art and love. Both bride and groom come from artistic backgrounds. By trade, Janie is a hair, makeup, and wardrobe stylist and Marcus is a photographer (and that is how their love story began!) With custom made details paired with rich family heirlooms, the wedding was very personable and memorable. We live in Loveland, Colorado. It is a town named number two on the list of "The 100 Best Art Towns in America", second only to Sante Fe, New Mexico. Loveland is also known as "The Sweetheart City". So we thought it was only appropriate to get married in a private garden located in a historic home in downtown Loveland. With just our family (large family!) and wedding party, we had an intimate ceremony and dinner here. The theme was Vintage Romance. With Janie being an artist and a lover of the wedding industry, we did a lot of custom decor and DIY projects. A lot. The first project being the "Will you be my bridesmaid?" gift that included a small bottle of wine, color swatch, and pinterest board link for the girls to pick out their wardrobe. 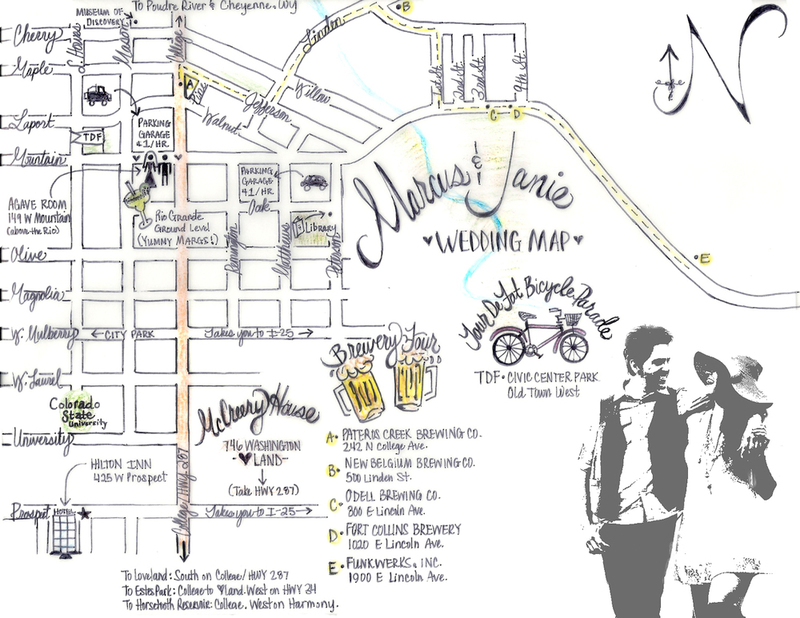 Next was the hand drawn wedding map to accommodate guests for the 5 day long celebration between the town of Loveland and the couple's favorite place to be, Fort Collins. The wedding activities included a "Old Prom Attire" powder paint war (boys vs girls), a Brewery Tour, and the annual Tour De Fat Bike Parade. We like to play, drink beer and ride bikes so it seemed fitting! -Bride's shoes. They were found at an antique store in Idaho for $9. They were bright orange with blue sole but they were the perfect style. The orange got covered with a mod podge/glitter mix and the sole painted with a light pink acrylic paint, then finished with 3 coats of polycrylic. -The bridal party dress hangers. -Signature cocktail table decoupaged with bible verses, vintage papers, gold glitter, and acrylic paints. -Cocktail Glasses made with Ikea glasses and glass candle stick holders. -Drink tags made with beer bottle caps. Custom painted so each one was different. -Fan wedding programs made with paint stir sticks. -The wedding centerpieces. Two-toned spray painted beer bottles and tall vases made with a kitchen tile and sheetrock corners. There were also a lot of special touches in details all around. Let's talk about THE dress. Janie fell in love with the color, sequence, and low back. However, it was completely see through and she didn't love the bottom of the dress. She took it into her seamstress Marsha who lined the dress, cut off the bottom, and made a new bottom. The best part about it, she attached the bottom part with snaps so Janie could detach it for the after party. With the sequenced material cut off from the bottom, Janie envisioned a headband veil inspired by the 1920's weddings that could be worn together or separate. Marsha made the vision come to life. The dress was perfection! Many of Marcus' family members are no longer with us but we very much wanted them to be apart of our special day. If you look closely at the bouquet, you will see three fabric flowers. The center of each of those flowers are Marcus' mom's brooches. Mixed in with the table decor & bridal party's accessories are family heirlooms such as his grandparents diaries, books, brooches, and other items from their old New Mexico ranch. The ceremony was very heartfelt with personal vows, a unity song written and performed by Janie's sisters, and a praise & worship session. One of the best parts of our dinner was our 4 year old daughter's impromptu speech and song. After our dinner, we had an after party with family, friends, and colleagues in downtown Fort Collins in a beautiful historic ballroom. It kept that vintage feel but brought in a little more glam. It was party time! A lot of food, drinks, dancing, a choreographed blues dance from us, drinks, and more drinks. And the rest is history! It was a beautiful wedding and we have incredible images forever to remind us how personal and perfect it was for who we are! One of the questions I got all the time throughout the planning process was, "So who's going to do your hair and makeup?" Well... perhaps I was crazy but I ended up doing 12 makeup applications that day. While it might have been crazy, I was glad to be doing what I love on my wedding day and getting to spend that one-on-one time with my beautiful wedding party. Theresa Elmore of Aquage did all the hair with the help of my interns Monica and Sharaiah. Holy moly, these girls are awesome!